Because I am doing my best to post daily… here’s a little trivia picture for you. 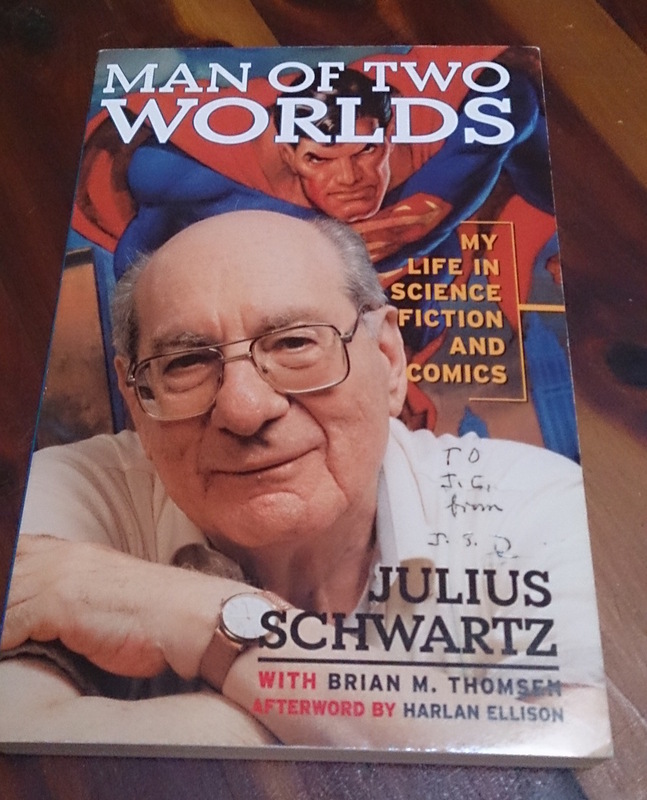 Before editor emeritus Julius Schwartz passed away, he wrote a (now out of print) biography called Man of Two Worlds: My Life in Science Fiction and Comics. KC, of course, pre-ordered a copy, and it arrived right before we were to go to a convention where Mr. Schwartz was appearing. Since the two of them had worked together before the older man’s retirement, we had no problem going up and saying hi while the show was getting started. KC asked for a signature, and the result is as seen here. Now, you will notice that Mr. Schwartz got KC’s name wrong, but, well, he was getting on in years. The reason I’m talking about this is that, since the book was just out, and since this show was his first public appearance after that, this is (as confirmed by Mr. Schwartz himself at the time), the first copy he signed to anyone. Which I think is kind of neat.